Fast 3kB alternative to React with the same modern API. Preact provides the thinnest possible Virtual DOM abstraction on top of the DOM. The web is a stable platform, it's time we stopped reimplementing it in the name of safety. 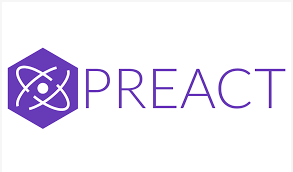 Preact is also a first-class citizen of the web platform. It diffs Virtual DOM against the DOM itself, registers real event handlers, and plays nicely with other libraries. Preact is fast, and not just because of its size. It's one of the fastest Virtual DOM libraries out there, thanks to a simple and predictable diff implementation. It even includes extra performance features like customizable update batching, optional async rendering, DOM recycling, and optimized event handling via Linked State. Preact's tiny footprint means you can take the powerful Virtual DOM Component paradigm to new places it couldn't otherwise go. Use Preact to build parts of an app without complex integration. Embed Preact into a widget and apply the same tools and techniques that you would to build a full app. Lightweight is a lot more fun when you don't have to sacrifice productivity to get there. Preact gets you productive right away. Virtual DOM Components make it easy to share reusable things - everything from buttons to data providers. Preact's design means you can seamlessly use thousands of Components available in the React ecosystem.